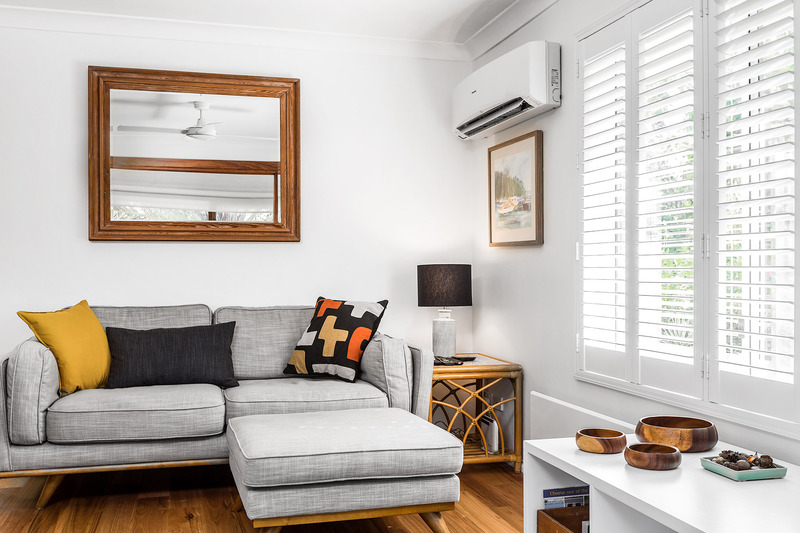 Little Geckos is an charming, bright and modern holiday apartment, ideally located in a quiet pocket of Byron Bay. 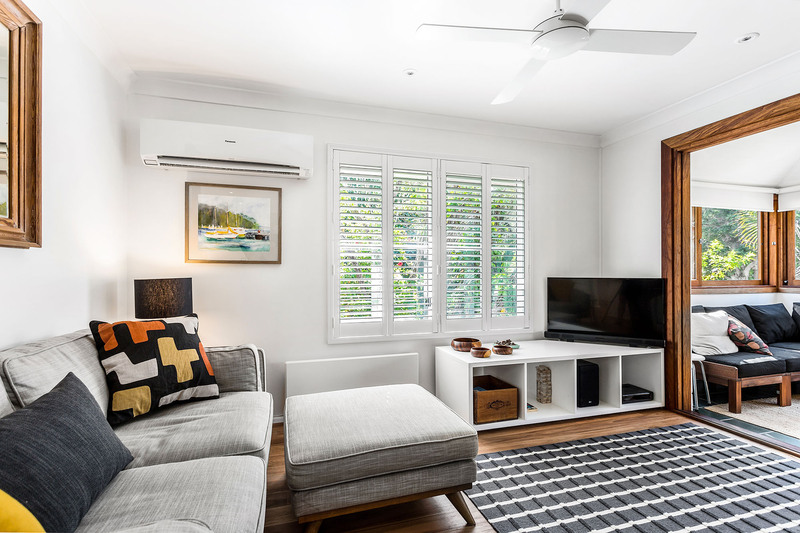 With 2 bedrooms and 1 bathroom, this sunny accommodation exudes relaxation in close proximity to Byron’s CBD and world-renowned beaches. 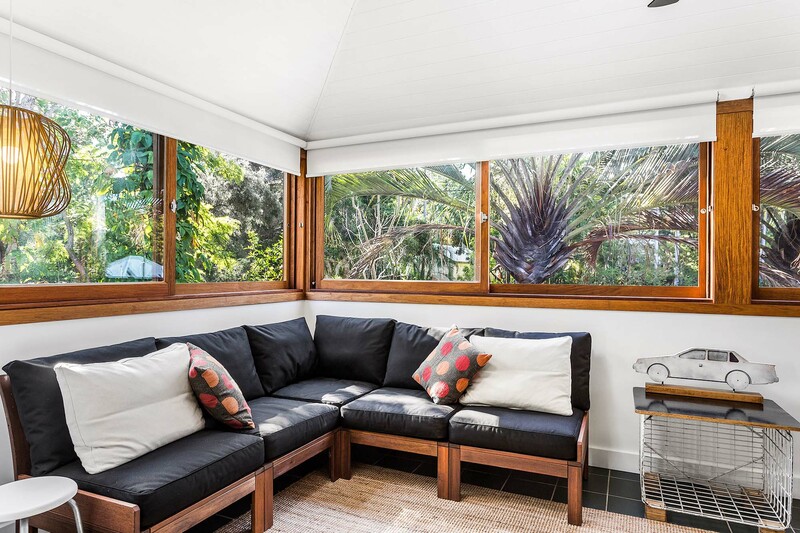 Spread out in the light-filled sunroom, or pop on some Netflix and chill on the comfy living room couches. 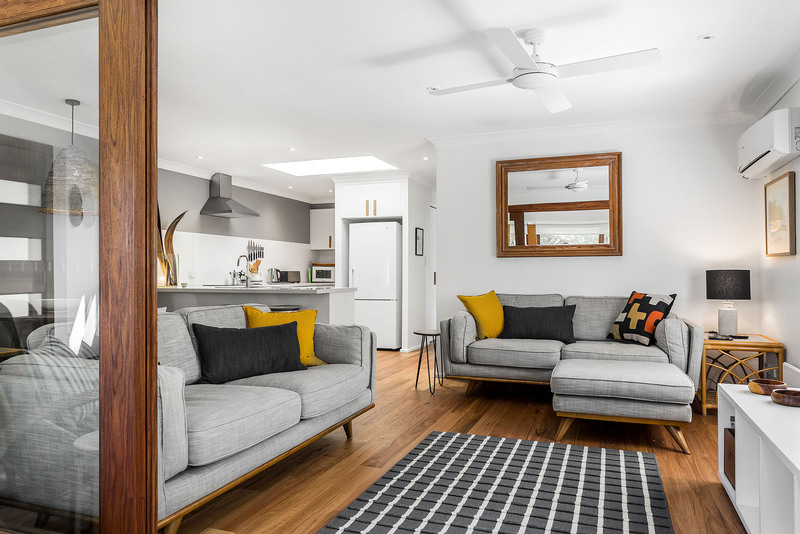 It’s easy to self-cater with a well-appointed chef’s kitchen and ample dining space, or stroll into town for a bite to eat with the locals. Enjoy Netflix viewing on the flat screen TV while relaxing on either of the two plush, comfy couches inside the open-concept living space. 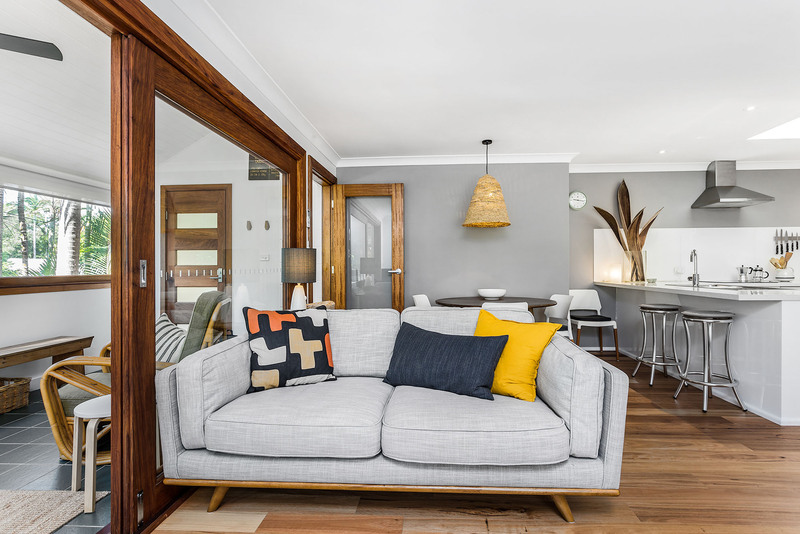 Large, sliding glass doors let in ample natural light and reveal an additional living space: a bright and inviting sunroom with additional couches and sliding glass and timber feature windows. 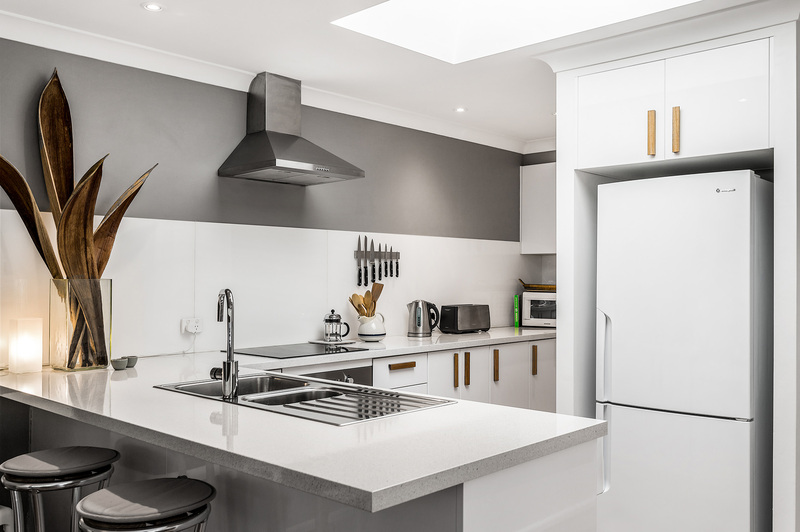 Little Geckos’ bright, modern kitchen offers a full range of chef-approved amenities including some stainless steel appliances. 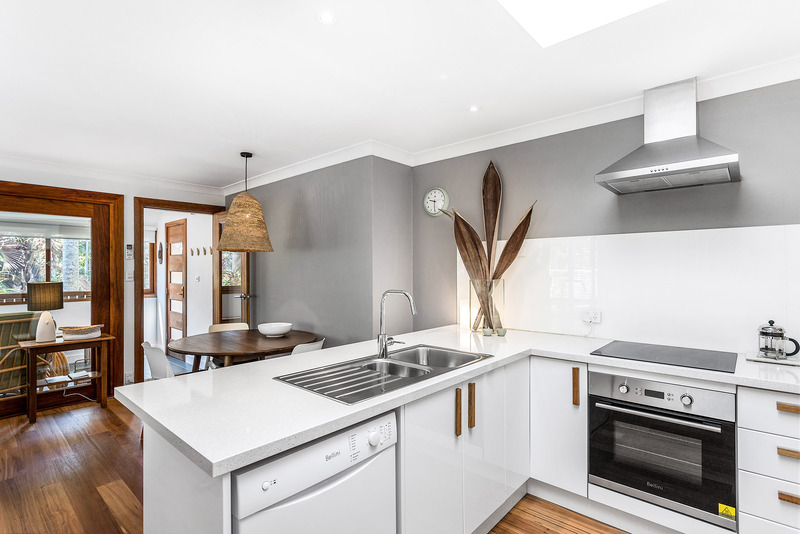 The kitchen is fitted with large breakfast bar for 3, while the electric hob, under counter oven, kettle, microwave oven, and dishwasher make prepping, cooking, and clean up all a breeze. 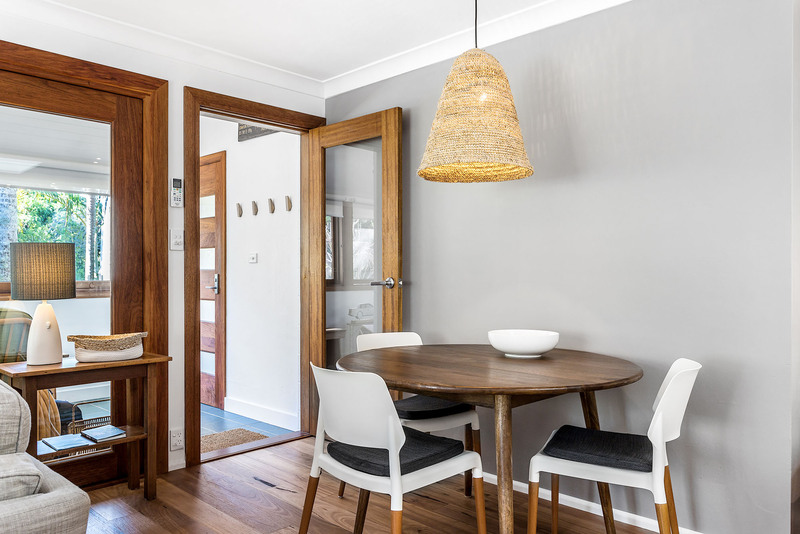 Enjoy an intimate meal together at home with a dining table for 4. 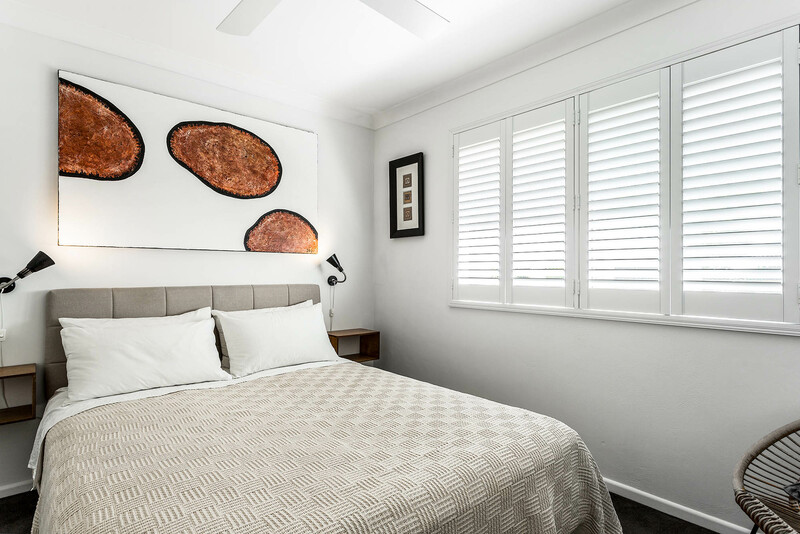 Two roomy bedrooms are well prepared for good night’s sleep with soft, premium-quality linen and plantation shutters ideal for some extra shut-eye. 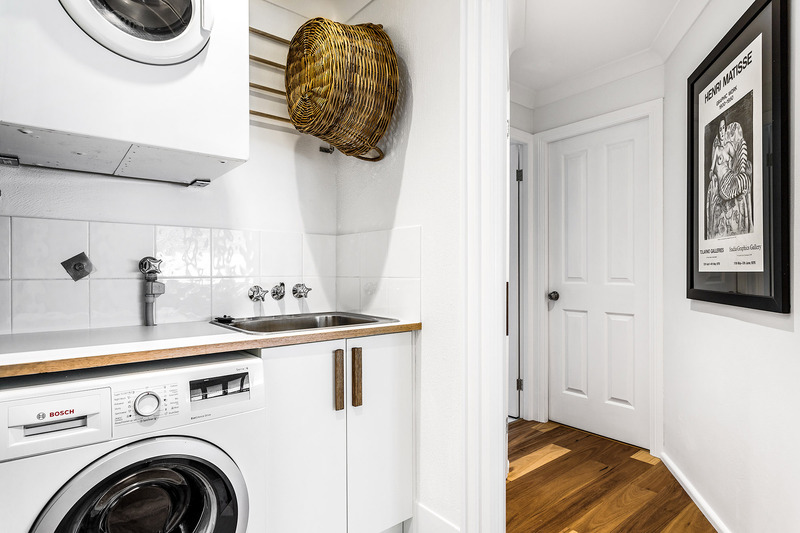 The master has built-in cupboards providing ample storage space for all your bits and bobs, while there is a shared, spacious bathroom in the hallway. 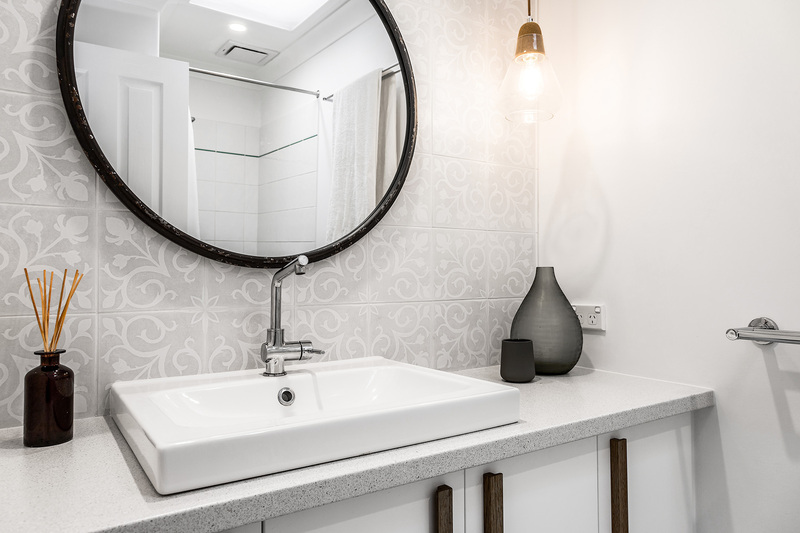 Bright and neutrally-adorned, Little Geckos’ bathroom makes excellent use of every inch so no one will be fighting for counter space. Beautiful, soft gray tilework provides the perfect backdrop for a stunning, centrepiece mirror over the large vanity and deep wash basin. There is a spacious shower and a separate toilet for added privacy. The sunroom, separated from the open living area by sliding glass doors, creates a unique and peaceful retreat that connects in the indoors to the outdoors. 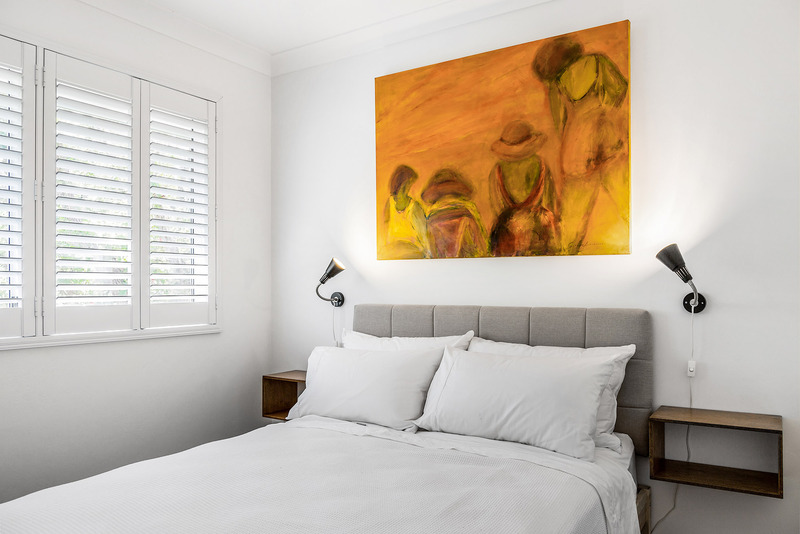 Catch the warmth of ample Byron Bay sunshine and curl up with your morning coffee or a glass of wine in the evening. The stunning, timber-framed windows can be opened up to let the breeze in with screens to protect from any little unwanted visitors. Close the windows for extra cosy space in the afternoon light. The garage underneath the apartment accommodates one small vehicle. There is additional undercover parking in the shared complex parking or on the street adjacent to the apartment building. 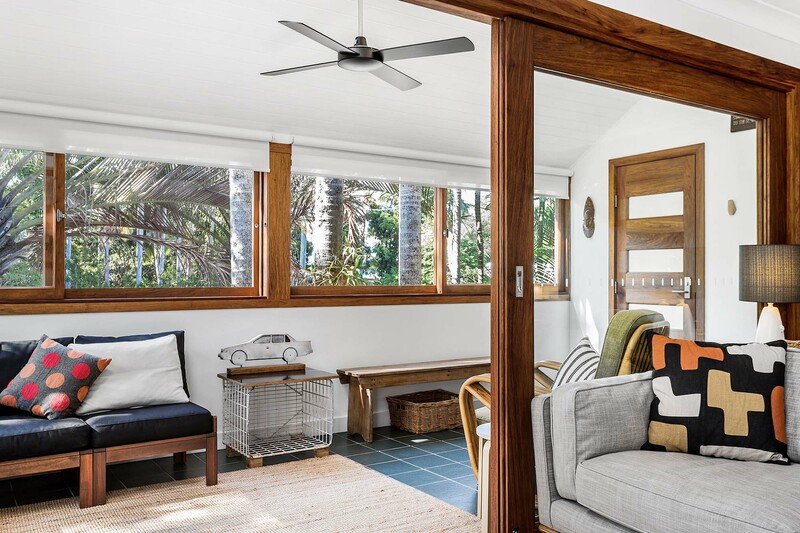 For those looking to experience Byron Bay like a local, you’ll find Little Geckos is perfectly positioned. Enjoy a bit of added privacy and the feeling of home in this quiet, residential neighbourhood. Your go-to local spot will surely be The General Store, just across the road from your apartment and one of the friendliest breakfast/lunch spots in the Byron food scene. There’s more to love just a 5-minute walk into town, with stylish boutiques like Spell & The Gypsy Collective even closer. Take a leisurely stroll through the Arakwal Nature Reserve and reach Tallows Beach in about 10 minutes. You’re equally close to Main and Clarkes Beaches to the north, so really, there’s no reason not to catch a few breaks every day! Stretch your legs and hit the Cape Byron Lighthouse track for a scenic walk around the Cape with jaw-dropping views over the ocean and hinterland.